IIIT Hyderabad announces its School Outreach Program, a summer series of non-residential certification courses for 7th - 10th standard students. With Information & Communication Technologies growing pervasive across industries, geographies and functions, it is imperative that fundamental Computational Thinking and Problem Solving skills become a part of the early education curriculum.The School Technology Education Program is the institute's first step in this direction. An introductory course to computer Computational Thinking and its application, developed based on the acclaimed curriculum of code.org for K-8 students. An exploratory course that touches upon various aspects of computer Computational Thinking and problem solving. Students will be selected on the basis ‘first come first served’. Keep in mind that English proficiency is required for all courses. We will provide limited course content depending on the nature of the program. If you have questions about course content, level, or prerequisites, e-mail to step@iiit.ac.in. Apply to the Student Technology Education Program (STEP) per the age/class eligibility criteria. Please note no exceptions will be made. Apply for a course in which you’ve an interest and/or will add value to your current school program(s). » The programs are introductory sessions only and are meant to familiarize the student with the related topic(s). » Application to a Program does not guarantee a confirmed registration for the program. » This is a certificate program, which will be awarded to the students on successful completion of the program only. » Admission will be subject to seat availability. » Offline and Online Tests may also be conducted during and at the end of the training to gauge a student’s level of knowledge. » The training will consist of both theoretical and practice sessions. Relevant course material will be provided. » 100% attendance on all training days is mandatory. For any exceptions, the Program Manager should be informed in advance. » Students should carry their own snacks/meals, water bottles, medicines, etc., which they may need during the training day(s). » The institute is responsible for the actual training session(s) only. The students/their family are responsible for the security, transportation and behaviour of the child on/off campus. They are also responsible for the safe-keeping of their belongings on the campus. No laptops are required to be brought to the campus and the institute is not responsible for the loss of any gadget of a student. » The entire program will be conducted in English medium only. » There will be no concession or refund of the course fee, without exceptions. » A student may be moved to a different batch/ age-group slot depending on the aptitude of the student and/or any internal adjustments as required from time to time. If you have any questions regarding the program, please reach out to us. 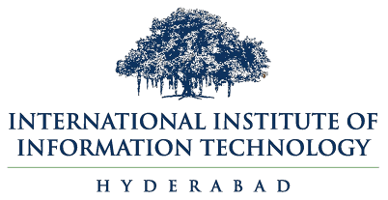 *DD to be in the favour of "International Institute of Information Technology, Hyderabad". The objective is to introduce Computational Thinking concepts to beginners in an easy-to-understand format. The course is designed to be both fun and rewarding with the student learning to explore problems and find new solutions. Our faculty will facilitate the training through both theoretical and task-based sessions. During the course the student will be able to work on a project per their aptitude and interest, using tools, templates and/or Computational Thinking. This course is customized to enable school students to learn 'Computational Thinking', whilst developing their problem solving, value judgement, negotiating and analytical skills from an early age. Both theoretical and practical sessions will be conducted during the course. During the course, the student will also be able to work on a project per their aptitude and interest, using tools, templates and/or Computational Thinking.